Writing materials will be provided, and mailboxes will be stationed throughout the garden areas of the park. Visitors are invited to write down anything that inspires them—from observations of a favorite tree to a poem or drawing, or any special memory from the park arboretum—and put the notes in the boxes. Arbor Day originated in the 1870s on the plains of Nebraska, when local journalist Julius Sterling Morton proposed a day of observance to encourage his fellow Nebraskans to plant trees to help the ecology of the land. A century later, President Nixon codified Arbor Day as a national observance along with several other environmentally friendly measures. These days, given the threats to our environment with global warming and climate change, the significance of Arbor Day takes on a whole new dimension as we recognize the ways the planting of trees helps refresh and rejuvenate our environment, while providing valuable shelter for many different species. In 2018, Madison Square Park was awarded Level 1 accreditation by ArbNet’s Arboretum Accreditation Program, designating the park as an accredited arboretum – a botanical garden dedicated to the cultivation, preservation and display of a wide range of tree species. The park is listed in the Morton Register of Arboreta, which houses a listing of arboreta around the world. 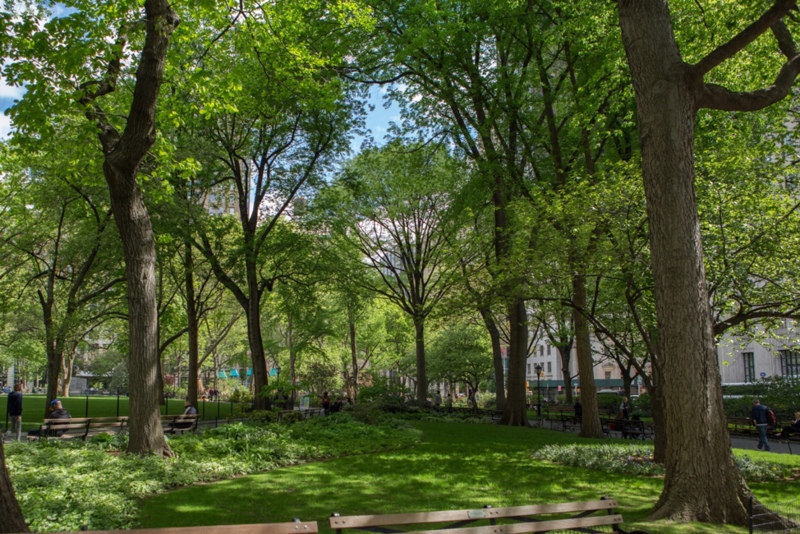 Be sure to stop by Madison Square Park on April 26th to write your own note of appreciation. And while you’re there, don’t forget to take some time and relax among the trees. You might also want to view the park’s two Ulmus procera. Both stand in the north end of the park, one on the Oval Lawn and the other behind the Farragut monument. While there are no surviving records confirming the ages of these trees, they are estimated to be around 300 years old.